Both the MOP bomb and the B1 bombers have received modifications recently and now Raytheon's announced they are fielding another well-suited tool for a for a battle in someplace like the Strait of Hormuz. 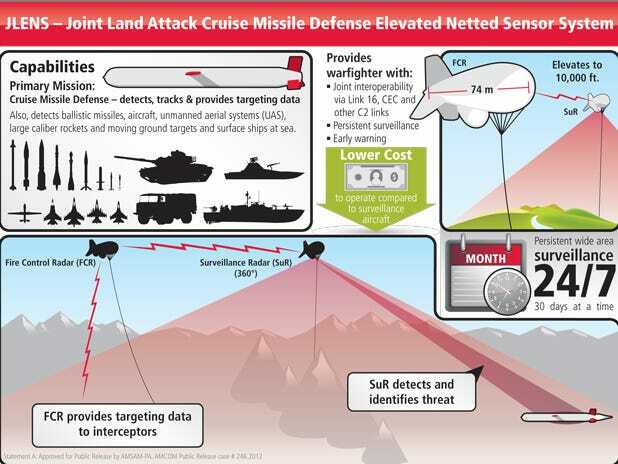 The Joint Land Attack Cruise Missile Defense Elevated Netted Sensor System (JLENS) is an 243 helium filled balloon that Raytheon says is ideal for monitoring, "Swarming boats, anti-ship cruise missiles, and mine laying ships." If that combination of attacks sounds familiar, it should. Iran's Republican Guard is famous for its swarming speed boat attacks, array of anti-ship missiles, and its proclivity for mining the Strait of Hormuz. The JLENS system can track these threats for 30 days at a time, from hundred of miles away, and at 10,000 feet above the ground. Army soldiers have been trained to use the system and it's prepared to be moved into the field and used in unnamed locations.